Nowadays, high-availability networks for critical systems is a must. From the technical point of view, the most advanced solutions ensure non-packet-loss in case of single network failure and “Plug & Work” operation. Additionally, customers demand interoperable and standardized solutions in order to avoid a proprietary vendor approach. In this sense, the International Electrotechnical Commission (IEC) has worked intensively to define High-Availability Ethernet based solutions. The two protocols that ensure zero-delay recovery time in case of a network failure are: High-availability Seamless Redundancy (HSR, IEC 62439-3-Clause 5) and Parallel Redundancy Protocol (PRP, IEC 62439-3-Clause 4). HSR provides redundancy by sending packets in both directions through a ring network. A simple HSR network consists in Doubly Attached Bridging Nodes, each having two Ethernet ports. A HSR node sends the same frame over both ports. A HSR capable destination node receives in fault-free state, two identical frames over both ports respectively within a certain interval. The first received is accepted while the duplicated is discarded. In case of an interruption in the ring, the frame will always be received through the other port. HSR offers high-availability and very short reaction time. In addition, the switching rules defined in the standard allow a simple way to calculate the delay in the communications for the Worst Case scenario, enabling the use of this protocol in applications that demand real-time. PRP redundancy is implemented in the nodes rather than in the network. Especially adapted nodes (Dual Attached Nodes – DANs) are connected to two independent Ethernet networks (LAN A and LAN B) and send the same frames over both networks. In a fault-free state, destination nodes consume the first received frame and discard the duplicated one. In case of a fault in one of the networks, the frames will still be transmitted and received through the other. 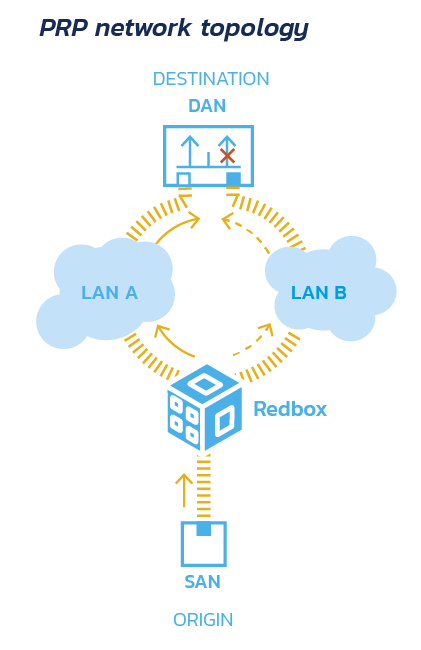 Non-PRP nodes can be attached to a single network, thus they communicate only with nodes attached to this network or connected to both networks through a Redbox.